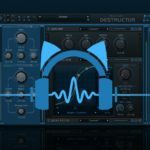 To follow up on the dark side of the Destructor, we are glad to interview today Sink, who was part of the beta testing team for Blue Cat’s Destructor and also created many factory presets for the plug-in. Let’s forget about guitar tones here, which is just one aspect of this non-linear channel strip plug-in. We’ll see what the plug-in can be used for in a more general context! I am a French electronic musician, producer, composer. 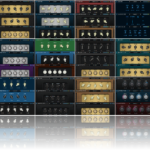 I have been making music for more than 15 years, playing live shows, releasing music on various labels, mixing bands, recording and producing samples, and getting involved into VST plugins design as well. My tastes are wide, from ambient to chiptune, electro-acoustic music to drum & bass, post-rock to acid, but most of my production now might be called IDM (think : Warp/Rephlex/Planet µ). What is your primary use of this plug-in? 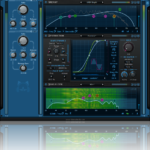 This plugin is so versatile that there is no such « primary use » : i can use it to add color and presence to a dull track, to fatten up a buss, to mangle layers of audio, or on the master buss to make the song punchier, warmer. When working fully in the box (ITB) or mixing with tight schedules, it can be very useful to process virtual instruments and give them a more «analog » sound (may it be tube, tape, OTA sound… you name it). What makes it different from what you already own? And why does it matter? It’s an all-in-one approach : it’s very handy to have a compressor and a pre-emphasis eq before the distorsion section, it really helps shaping things more easily and it makes the workflow great. What is your favorite feature, if any? I don’t know : maybe the « all in one » approach, or the great attention paid to details : For instance, being able to shape the distorsion curve to taste and dial in just the right amount of drive is great, but imho the dual pre/post eq sections are in fact as much a part of the core sound than the distorsion curve itself. The many GUI styles are also great to look at, and can be useful when you have several instances, as you can spot the one you need to edit more easily. What is your typical workflow when designing a tone with this plug-in? I like to experiment, so there is no typical workflow : sometimes, i will just tame peaks using the compressor, and use some smooth substractive eq-ing before reaching the saturation unit, starting with a soft clipper curve, but i also like to get carried away by tweaking, and sometimes it ends up very differently. It can also be fun to draw a random curve, slap a comb filter and listen to the result ! Is there a particular type of instrument or sound that you like to alter with the plug-in? Drum machines and analog synths mainly. The plug-in is quite flexible and can do lots of things. What have you used it for already? 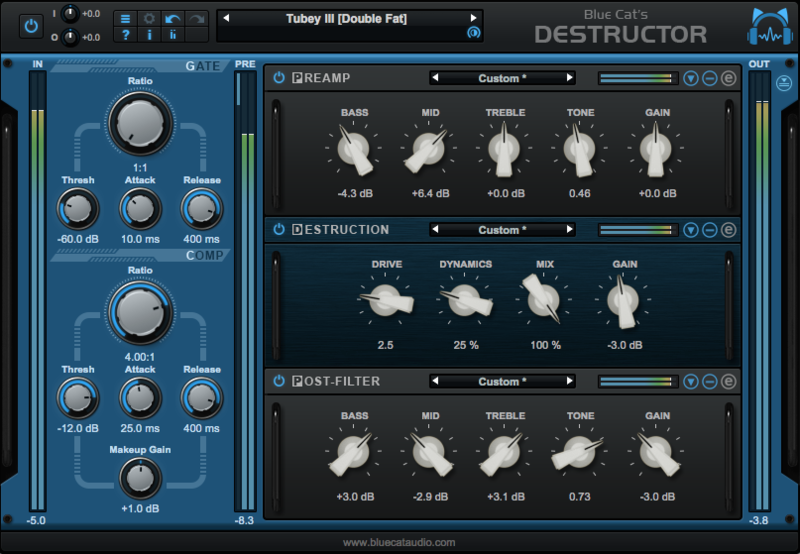 Have you experienced any exotic or awkward/unexpected application of this plug-in? Any advice for newcomers who open the plug-in for the first time? Try the presets, and take your time to discover it ! 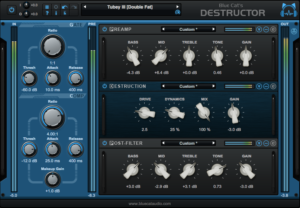 Don’t be fooled by the « guitar amp sim » first look, Destructor can be great in so many scenarios that it is not « just another amp sim » but a true sonic toolbox ! This entry was posted in Community, Tip of the Day / Tutorials and tagged Destructor by bluecat. Bookmark the permalink.